^ The Literary Magazine - the Biafra War and the Age of Pestilence by Herbert Ekwe Ekwe. ^ Sadleman, Stephen. The Ties That Divide. 2000: 86 [8 June 2018]. 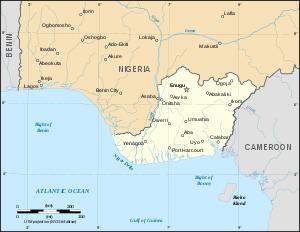 ^ The Biafran War, Nigerian History, Nigerian Civil War. [2017-10-30]. （原始内容存档于2008-03-12）. ^ 17.0 17.1 17.2 Karl DeRouen & U. K. Heo (2007). Civil wars of the world: Major conflicts since World War II. Tomo I. Santa Bárbara: ABC CLIO, pp. 569. ISBN 978-1-85109-919-1. ^ 19.0 19.1 Dr. Onyema Nkwocha (2010). The Republic of Biafra: Once Upon a Time in Nigeria My Story of the Biafra-Nigerian Civil War - A Struggle for Survival (1967–1970). Bloomington: AuthorHouse, pp. 25. ISBN 978-1-4520-6867-1. ^ 21.0 21.1 21.2 Phillips, Charles, & Alan Axelrod (2005). "Nigerian-Biafran War". Encyclopedia of Wars. Tomo II. New York: Facts On File, Inc., ISBN 978-0-8160-2853-5. ^ West Africa. Londres: Afrimedia International, 1969, pp. 1565. 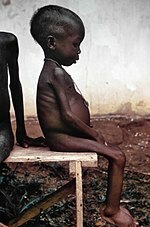 "Malnutrition affects adults less than children, half of whom have now died, reports Debrel who also describes the reorganisation of the Biafran army after the 1968 defeats, making it a "political" army of 110,000 men; its automatic weapons, (...)".